A freshly scrubbed front glass can transform the appearance of a reef tank and make all the hard work involved in maintenance seem worthwhile. There’s nothing like cleaning the front glass, sitting back and realizing that the tank looks better than you remembered. It seems that every hobbyist develops his or her own preferred cleaning regimen. Some hobbyists favor razorblades while others favor plastic scrapers. The problem with these methods is that it invariably involves getting wet. For a small tank it may mean just getting one’s hands wet, but for a large tank, cleaning the glass with a scraper generally means sticking much of one’s arm into the tank. While some hobbyists look forward to sticking their arms in the tank, others prefer to keep dry. For these folks the cleaning magnet is the solution. The process is simple and nearly fool-proof in small freshwater tanks. However, reefkeeping presents a much greater challenge for algae cleaning magnets. Like an arms race where escalation on one side is met by escalation on the other, the rapid development of larger reef tanks has created the pressure to produce more powerful cleaning magnets that work with larger tanks and thicker glass. The cleaning magnets of the past used weak magnets that could remove a thin coating of hair algae on thin glass, but not much else. Used on a reef tank, one generally ends up still having to stick one’s arm in the water either to use a razor-blade to remove coralline algae, or to retrieve the magnet from the bottom of the tank because of too vigorous scraping. One may not think of Madison, Wisconsin as the epicenter of algae cleaning rare-earth magnets, but Madison is the home of two magnetic algae cleaner producers. 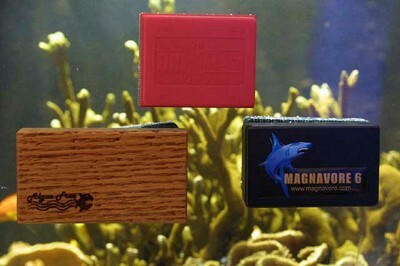 Both Magnavore and Algae Free are based in Madison and both sell an extensive line of cleaning magnets. That’s one irony of the escalation of algae cleaning magnets. The hobby has gone from one or two choices to a somewhat confusing array of choices in just a few years. Both companies sell “rare-earth” magnet based cleaners. The rare earth reference is to Neodymium, or more accurately a compound called NIB, for Neodymium Iron Boron (Nd2Fe14B). For many years I used the Algen Magneet with my 300 gallon 3/4 inch glass reef tank. If I wasn’t too vigorous in my cleaning, the two parts generally held together. Too often I still needed to get in the water to scrape bits of coralline algae off the glass and the last bits always seemed to appear in the hardest to reach portions of the glass. When I moved everything to my larger tank with 1 inch glass I knew that the Algen Magneet would not be strong enough. Using their web sites, www.aquariumcleaner.com and www.magnavore.com . I ordered the magnets recommended for 1 inch glass. Both companies delivered the magnets within a few days. From personal experience it seems that most products intended for the hobby are optimistically rated. If something is intended for a 50 gallon tank, it has been my observation that in typical use the product should be used in tanks smaller than 50 gallons. The magnets of Algae Free and Magnavore may be one notable exception. Both companies’ magnets rated for one inch glass grip with a great deal of force. It takes consider effort to slide the magnets across the glass. As I stated earlier, the force needed to clean algae on a given thickness of glass is a subjective decision. Therefore, one can only offer an opinion. In the view of this hobbyist, the magnets are very conservatively rated. Hobbyists may be able to use a magnet intended for slightly thinner glass. I attempted to measure the force needed to move the magnets along the glass and could easily measure the difference between an Algen Magneet and the two cleaners under discussion. However while I could feel a difference between the Magnavore 8 and the Algae Free Great White, I couldn’t reliably measure the difference. Using an electronic scale to measure the needed force, I pulled the magnets along the glass at a “constant” speed, noting the read-out. The Magneet moved along smoothly at 2 pounds. Both the Magnavore 8 and the Great White required approximately 8 pounds of force to move along the same section of glass at the same speed. This is certainly a crude measurement, but hobbyists using an inexpensive fish scale could do similar measurements on their own tank to compare magnets. This is one example where the pooled resources of a hobbyist club could help members compare different magnets. One danger of using algae cleaner magnets is the risk of scratching the tank. Small bits of coral and sand can work themselves into the magnet’s abrasive surface and create fine scratches on the tank surface. This is particularly true of softer acrylic tanks. Both companies provide special pads to be used on acrylic tanks. Choosing a slightly under-rated magnet may also help in avoiding scratches. The most important caution regarding these magnets is their force. Both magnets come with a very think piece of foam separating the two sides. Should the two sides be accidentally brought together, the hobbyist will probably not be able to separate them. If one’s fingers are between the two halves when they snap together, serious injury is possible. If a hobbyist uses any of these powerful magnets, be very careful while handling them. Also follow the instructions carefully when attaching them to the tank. They need to be slid towards one another while in contact with the glass. Just bringing them together on opposite sides of the glass could break the glass from the force applied. One other note regarding the magnets. Algae magnets are useful for things other than cleaning algae. For example, I use magnets to attach romaine lettuce to the glass. Suction cups can fail and float away, but attaching a leaf of romaine with a magnet and then sliding it down the glass will keep one’s hands dry and keep the lettuce in place longer than a suction cup. Other hobbyists have glued powerheads to algae magnets. The magnets allow the hobbyist to move the powerhead as needed and avoid using suction cups.